Welcome to the official website of the Columbia County Democratic party of Georgia! Our major goals are to enhance public education, provide universal health care, and maintain public safety. We believe in women's choice, affirmative action, increased minimum wage, recognition of unions as an important aid to labor, campaign finance reform, and environmental protection. We oppose preemptive war but insist that our troops have proper armaments when they are placed in harm's way. We oppose privatization of Social Security and we oppose a ban on gay marriage. Also not fans of kids in cages or the family separation policy at the border. Become a member! Twenty-five bucks and you can literally be a card carrier. CCDP Meetings are typically held on the first Monday of every month, at 6:30 pm at the Columbia County Government Complex, Building A, at 630 Ronald Reagan Drive, Evans, GA 30809. Check out this year’s meeting calendar. The next meeting will be on Monday, May 6. Announcing the Winner of the Columbia County Democratic Party Slogan Contest! The contest for the new CCDC slogan ended Sunday at 5 pm. Submitted by J. Gregory who has won a $25 Starbucks gift card. CONGRATULATIONS! Thank you to everyone who submitted their excellent slogans. STEP UP AND SUPPORT OUR SCHOLARSHIPS! The Columbia County Democratic Party’s scholarship Committee has been awarding scholarships to seniors in Columbia County since 2010. We have awarded 24 deserving seniors each a $500 scholarship, totaling $12,000. At our August meeting, we presented four $500 awards to four deserving high school seniors. We fund the scholarship program almost entirely through donations. We are now able to accept your donations through Paypal. Thank you to all of you who have contributed throughout the years, and we hope your generosity will continue. This is a worthy cause, and something that all Democrats in Columbia County should embrace. This is one the more prominent reach-outs to the community from our party. Press the button below to donate. Yes, I want to be a scholarship supporter! This is our last chance to stop HB 481. This six week ban would outlaw abortion before most women even know they're pregnant. Gov. Kemp has promised to sign this bill into law. But we can stop this from happening. Call, write and email to let him know that hard-fought women's rights are non-negotiable. 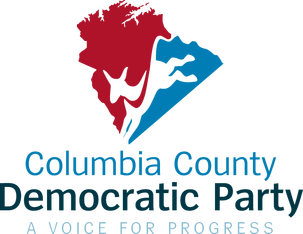 Don't forget to register for the Columbia County Democratic Party Team! The best way to register for the relay is to call 800 227 2345, then select option 2. When connected with a specialist, the caller should ask to be registered for the Columbia County Georgia Relay and the Columbia County Democratic Party Team. The phone line should be open 24/7. This method should be stress and problem free. Any questions, contact Joyce Dejoie at jdejoie@att.net. First, I would like to congratulate you all on a hard fought election season and on the fact that Democrats now control the House by a more significance percentage that expected! Take a moment to celebrate that! Second, I would like to specifically celebrate our accomplishments in Columbia County. Looking at the county breakdowns, I want to point out that, in 2014, 26% of the votes in Columbia County were from Democrats (or people voting our ticket). In 2016, 27% of the votes were from Democrats. This year, almost 33% of the votes were from Democrats. That's a significant jump, and I think we owe a lot to our Coordinated Campaign organizers, Lynda Luden, and all the volunteers in our local party. Congratulations to each and every one of you! Don't lose hope. Don't give up. We are making a difference. It's just going to be one small step forward at a time. As a mother of five children, I have spent a lot of time agonizing over the current situation immigrant families are encountering in our country - namely, being forcibly separated. There are no words to describe the fear, pain, devastation I would feel under those circumstances. There are no words to describe my anger now, as I watch President Trump attempt to use these children as a bargaining chip for his divisive agenda. We must stand up. We must demand that this practice is stopped. And, we must insist that our Republican and Democratic leadership do so with no strings attached. They must act in the interest of these families because it is the morally correct action to take. So, I implore you. Call. Write. If you don’t know where to start, go to our website (you are already here) at http://www.democratsofcolumbiacounty.com/links.html. Or you can refer to the Elected Officials attachment. Click to get contact information for our members of Congress. Let’s not just be angry or distraught. Let’s follow through with action. A phone call is not much to ask. After all, what lengths would you be willing to go to in order to save your own child?